Now-a-days pumping concrete to inaccessible distance is very common. Different specifications are established to make concrete workable and successfully used in concrete industry. We will not discuss here about normal-weight aggregate concrete, our concern is here application of light-weight aggregate in pumpable concrete. The difficulties with using light-weight aggregate in concrete to be pumped are observed when surface of aggregate is not sealed as water demand of the mix increased greatly. When pressure is exerted by pump, the air voids in the aggregate get contracted. 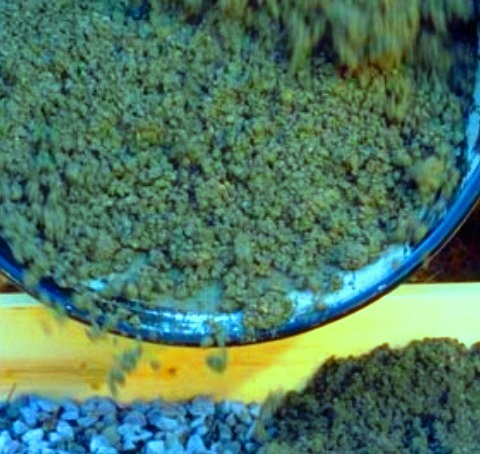 Water from the mix enters into the aggregate pores raising water demand. The mix, in this case, becomes very dry and problem with pumpability arises. We know lightweight aggregate have voids filled with air which render low unit weight to them . The remedy is to soak both coarse and fine aggregate for a period of two to three days. Alternatively vacuum saturation at dry rapid rate can be applied. The water absorbed in this way do not become a part of free water within the mix but affect in mix proportioning by mass. It was reported that light-weight concrete has successfully pumped vertically up to 1050 ft. But saturation of aggregate in such way affects durability of concrete in respect of freezing-thawing exposure. The recommendation is this case is to protect concrete from exposure to such temperature. We know several insulation techniques are adopted in cold water concreting. But when ambient temperature is very low dependence on waiting period is not enough to mitigate such problem. Special agent in addition to application of low absorbent aggregate may provide us a proper remedy for increment of water demand and freezing-thawing problems. The agents stated above, when added to concrete mix, they enter into the pores around aggregate surface. When initial hydration of cement takes place the PH in the system is increased. With increased PH the viscosity of the agent also increased to form a high-viscous layer which isolates water from aggregate and absorption under pumping pressure is reduced.